The Flip Side: We're Going to Uganda! That's right, you didn't read it wrong. We finally have a posting, and it's not Chad. 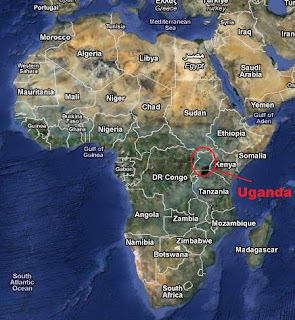 We will be headed to Uganda to fly there with Mission Aviation Fellowship. It may come as a surprise to many of you after months of hearing us say that we will probably be in either Chad or Tanzania, but we knew all along that the "probably" was a big one, and we could end up in a lot of different places. For the last couple of weeks we've known that MAF has been exploring many places for us to serve, and this morning we have received word that we will indeed be going to Uganda. This news is very new to us and we aren't able to answer a lot of questions about it at this time. It appears that the flight program in Uganda is a busy one. The majority of their flying happens in Uganda, but there is also a significant portion that goes on north into South Sudan. Historically they have also flown a little bit into east Democratic Republic of the Congo and northern Tanzania, but it appears that they are carrying out fewer and fewer flights into those areas now. I haven't had a chance to look into the political situation yet, so I can't comment on that right now. Uganda is situated to the west of Kenya, south of South Sudan, east of the DRC and north of Tanzania. How do we feel about this news? We are very excited about this. Many of you know that we have been praying about a placement for many months, and to receive this news this morning was a huge answer to prayer. For the past few weeks God has been preparing us to serve in Uganda, and we received the news with joyful hearts. You may be wondering about how God has been preparing us for Uganda, because it has never been "on the table" as an option for our placement before this time. That's a question that you'll have to ask God. All we know is that a couple weeks ago upon receiving an email regarding our placement (it didn't mention any country by name or location), I turned to Karen and said, "I think that we're going to end up in Uganda." That sentiment has been in my heart since that time. I don't know where the thought came from, but there it was and it was really exciting to learn that we will indeed be going there. It was another answer to prayer as we have also been praying that God would give us a love for the people of "the country" where we are headed. I have found the website for Operation World to be a great resource. If you would like to learn a little bit more about the religions and needs in the country of Uganda, click HERE. Thank you for your prayers and support during this time. We ask for your continued prayers as we begin to learn more about the specifics and details of what we will be doing there and where we will be living, school for the kids, etc, etc... Praise be to God!